Hi, Tom. If it's the symbol on the door you're talking about I would do some research on it. I think it's beautiful, and it may have some meaning to the friend that you lost. If you find out anything, please let us know. Good luck to you. 6-8-15. That is an amazing orb. 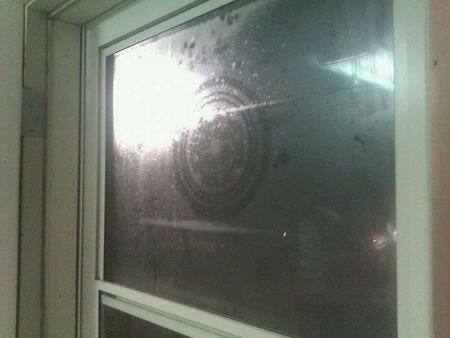 I worked in a building on Reservation Road in Hays, KS where orbs became a part of my daily life. A young man had lost his life there some years before I came. I think he protected an Autistic Savant Artist. When I would take pictures there would be orbs everywhere. It didn't matter what part of the building whether it was light or dark. The orbs were always there. I never felt threatened there, but you sure could feel an aura in that building but mostly protected. Thanks for the window orb. .
Wow! Amazing. I know of a relative, and every picture she would take had an orb in it. Long story but she helps others out by working with angels from God and such. For instance parents that had a child die from suicide she communicates with the love one who passed or the angel guarding over them to put the parent at ease. My relative is Christian, but does this to help people. I believe in the Bible, and I am Christian, and the Bible is clear that we should never communicate with angels or so called love ones who passed on. Therefore my relative is playing with the devil and demons unfortunately. I also used to have orbs around me for a while in my photos. However, I gave my life to Jesus Christ, and they no longer exist. Bottom line is who cares if something feels peaceful or looks peaceful. The Bible clearly says Satan comes in the disguise of an angel or Jesus Christ himself. Don't trust feeling nice images or anything. Only the word of God and Jesus Christ. These orbs and signs that I have experienced in my life came feeling peaceful. Use Jesus Christ to fight our battles, and he wipes them all away. The Bible says test every spirit. What does that mean? Don't trust them, but get right with the Lord, and they will cease to exist. We are grateful for angels, but we do not pray to them or worship them in the least as the Bible says. God bless!.